I told you I would send you some pictures HI HI. We put it up last Friday 10-29-2010 it is working GREAT I have been getting 59+++ signal reports all over the world, what a eye opener how much better it works at 85 feet than were it was at 22 feet WOW. It is dead flat over the whole Band I can hear signals other stations can't, they asked me are you really coping Him the answer is Hell yes. 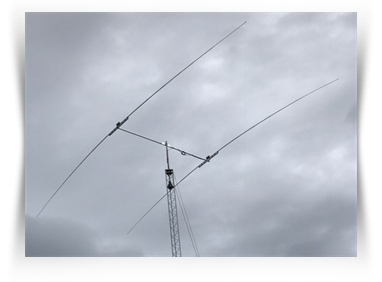 In 2015 I installed a new Rohn 55 G tower and decided to put up a Mosley CL-203 20 meter monobander! It was one of the best decisions I have ever made with an antenna! We are in the declining sun cycle and this antenna really performs! I live on top of a hill and get 60+mph winds very often and the antenna is rock solid! I am 70 years old and I think this will be the last antenna I will ever need? 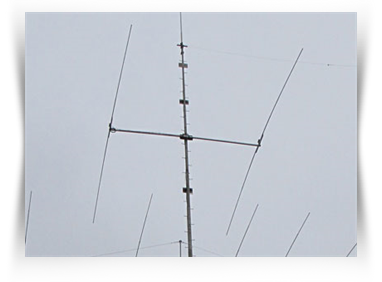 Thanks to Mosley for building high quality antennas that really perform ! Incorporating the Mosley patented Classic Feed System, full size single-band beams for 10 through 20 meters have "swaged" elements and wide spacing from THREE to SIX elements. The high standards in quality construction established by Mosley in over a half-century of manufacturing is reflected in the mono-band Classic Series. Boom-to-mast clamping assures stability with a time-tested arrangement of mast plate, stainless steel U-bolts, and cast aluminum clamping blocks. The exclusive "Balanced Capacitive Matching" System has a nominal feed point impedance of 52 ohms at resonance. No Measuring... Color-Coded, and Pre-drilled for ease of assembly. Backed by Mosley's two year warranty against defects in material and workmanship. Mosley Amateur antennas are pre-tuned, pre-drilled and color-coded for ease of assembly which means NO MEASURING! Hand-crafted under rigid engineering standards, Mosley antennas are constructed of highly durable drawn, aluminum tubing to withstand wind loads of (EIA Standard) 80 miles per hour. All stainless steel and non-corrosive hardware insuring longer antenna life... an average of 30 years! Mosley antennas and antenna accessories are guaranteed free of defects in material and workmanship for a period of two years from the date of delivery. Mosley offers a variety of designs to meet the ever changing needs of Amateurs today. Hams who work both Phone and CW will appreciate the broad bandwidth characteristics of the Mosley "Power-Master" antenna series. 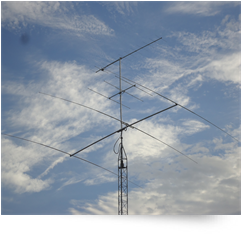 Looking for that big signal and superior construction; check out the original "Classic" and "Signal-Master" antenna series. Mosley employs several different efficient feed designs to meet customer demand and preference. For more information concerning our feed systems, please see our FAQ section. In addition to the antennas herein listed, Mosley can produce a wide variety of larger monoband beams to meet specific requirements. Just write or e-mail your project needs. From cataloged antennas to custom-engineered "systems", Mosley Electronics, Inc. is anxious to serve you. Whatever your antenna needs may be, think first of Mosley...the World's Leader in Quality communication antennas. Custom order six element designs & 40 Meter Classic models available by special order. Contact us for details. Mosley "Power-Master" beams are full sized arrays, each designed for operation on a single band. Mosley A-310, 10 meter three element. Mosley A-315, 15 meter three element. Mosley A-320, 20 meter three element. Superlative performance and construction characterizes each beam to insure satisfaction under most adverse conditions. Antennas are 100% rust proof. Stainless steel hardware, high impact polystyrene insulators with drawn aluminum elements and boom will provide many additional years of trouble-free operation. Low SWR over entire band width. Maximum gain on all bands with an operating capacity well over 3 KW. All "Power-Master" antennas are fed with 52 ohm coax using the famous Mosley Match. "Forty" is the HOT band now and the Mosley "Signal-Master" antennas are the beams to give your signal real authority! These rugged beauties are designed and engineered to provide the performance you need whether you are DX hunting or relaxing in a pleasant rag-chewing session. Efficient Link Coupled Feed Coils are weather and dirt-proof offering resonant frequency stability under all weather conditions. Pre-drilled and color-coded elements for ease of assembly. 30 meter beams are full sized and built to last... ..."Command your band with a Mosley!" All "Signal-Master" antennas are fed with 52 ohm coax using the famous Mosley Match. The SF-402-A is a heavy duty, smaller 2 element beam for 40 Meters - SMALLER than the Mosley S-402-M - but still has BIG performance! The SF-402-A is on a 14 foot boom and is less than 48 pounds assembled! This smaller beam is built in the MOSLEY tradition and will give you YEARS of great performance! The Mosley "Signal Master" efficient link coupled feed coils are weather and dirt-proof offering resonant stability under any weather conditions. Pre-drilled and color coded elements for ease of assembly. Mosley, …a better antenna! SMALLER In Size - BIG In Performance! 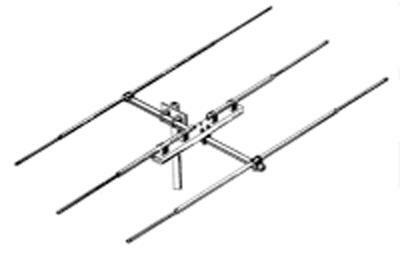 ROTATABLE DIPOLE & 2 ELEMENT VERSIONS AVAILABLE! 3" OD Boom versions available for most models. Contact us for specifications.